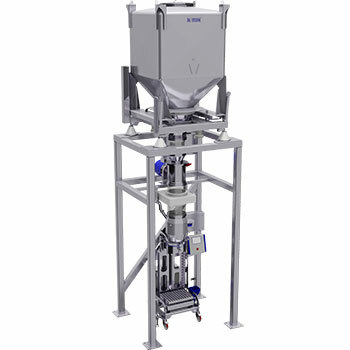 Ensure product quality with reliable powder feeds. Automated, controlled flow with complete discharge from original Cone Valve IBCs. The unique Cone Valve technology within the Matcon IBCs prevents mix segregation, which is vital when feeding to powder packing machine and third party equipment. 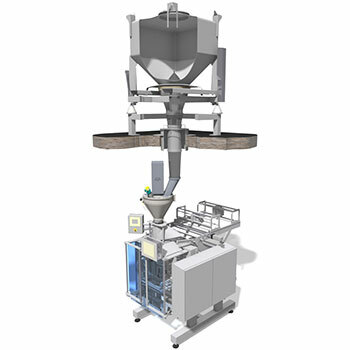 Optimise packing line throughput with reliable product feeds. High accuracy bag filling directly from Cone Valve IBCs. Discharge the IBC straight into FMCG packing systems without any secondary refill devices. Automatic and controlled refill, producing a consistent feed, allowing packing lines to maximise their throughput. Cone Valve technology protects against product segregation during discharge to ensure a quality product every time. Maintains homogeneity during discharge due to mass-flow. Dust-free transfer to powder packing machine. Cone Valve protects against bridging, blocking or segregation. Change recipes faster than ever with high accuracy, direct dosing from Matcon IBCs. Fill into sacks/bags without the need for screw feeders. Ideal for small campaign runs. Versatile enough to cover a wide range of powder characteristics from cohesive to free-flowing. Full discharge & protection against segregation due to mass-flow. Simple to use powder packing machine. Easy to strip & clean contact parts. Changeover by Operator not Engineering. Fill bags 10-25kg at a rate of 1-2 bags/minute. No need for secondary feeders. Additional quality control from optional sifting and metal detection.